Collegio priests who foresee the need to make financial transactions, e.g., cashing a check, receive allowances from abroad, etc., are urged to open an account in Euro at the Istituto per le Opere di Religione (IOR). 6. fotocopy of your enrollment certificate from the university (or the Preiscrizione). 1. Enter through this gate. Office hours: 7:30 am to 4:00 pm (no noon break). 1. Enter the doors with security check, go up the right staircase. Immediately to the right, you will see a desk for new accounts. Submit your documents there. Remember not to leave any originals behind, except for the Rector’s letter to IOR. 2. You may also open a US Dollar account, though this is not really necessary. Cash, checks or money transfers in US Dollars may be deposited directly to your Euro account, converting them to Euros at the current exchange rate. You may also withdraw USD from your EUR account anytime, again, applying the current exchange rate. 3. If you want to exchange USD to EUR, you first need to deposit your USD into your EUR account, then using the same sheet, withdraw in Euros. Also vice versa, to exchange EUR to USD. 4. No interest is earned on your savings, and a minimum deposit of some €50 is needed to avoid more bank charges. 5. Ask for an ATM card. This is free, but they do not issue one unless you explicitly ask for it. 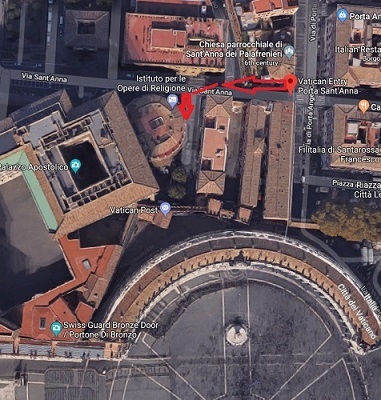 It has practically no function, except to allow you to withdraw outside office hours, using ATM’s located just across the IOR building and in Piazza San Calisto in Trastevere. 6. A €4,000 minimum deposit is required if you ask for a Credit/Debit card (which you might not really need after all).